This cute Angel Carol Singer is pretty, but also easy to make at home! She will look perfect on top of your Christmas tree. 1. Paint your Styrofoam ball pink, once dry you can draw on a face with closed eyes and a singing mouth. Add on two rosy red cheeks with the eraser on the back of a pencil. 2. 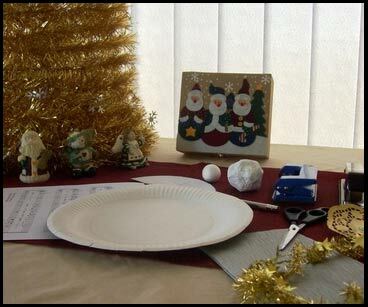 Take either your paper plate or cardboard and trace the angel body pattern onto it with a pencil. Cut it out and staple together. 3. Use the same pattern to make a dress for your angel with the crepe paper. Trace onto crepe paper and cut out. 4. Glue the dress onto your angel. Keep left-over pieces for her sleeves. 5. Take a white pipe cleaner and make two loops at the end for your angel’s hands. 6. Put the pipe cleaner in the centre of your rectangle crepe paper and glue in place. 7. Cut a small piece off your gold pipe cleaner or use gold tinsel to make a halo. Make the pipe cleaner or tinsel into a ball, put glue on your angel’s head and hold the halo in place. 8. Now attach your angel’s head onto her body with glue. 9. Take the angel’s arms and sleeves and place them behind her shoulders with glue. 10. Now decorate her dress with a pipe cleaner and embellishments or sequins. 11. Make her wings with a doilie, cut in quarters and paste two quarters against one another, gold/silver facing out. 12. Take sheet music and glue it together, cut into a little square and fold in half. 13.Place the square of sheet music in your angel’s hands with/without glue. 14. Add her wings using double-sided tape. And voila! She is ready for the Christmas tree.